Forget the fact that the Toronto Maple Leafs and Boston Bruins are divisional rivals. Forget the good and the bad blood between the two franchises for a second – after all, both teams have been around for quite a while when it comes to the NHL. There have been moments in the history of the game where these two teams have collided at the trade table. While it isn’t often – as you’ll see from the last five moves between the Leafs and Bruins – there is a storied history of acquisitions between the two clubs with the Bruins arguably coming out with the upper hand. That said, here’s a look at the most recent transactions between the two long-time NHL franchises. To find the most recent trade between the two teams, you have to go back to Feb. 18, 2011. The Leafs were looking to move long-time defenceman Tomas Kaberle, while the Bruins were hoping to acquire a veteran defenceman for a playoff push. As it stands, both teams sort of got what they wanted. The Leafs shipped out their 11th highest all-time scorer in Kaberle and, in return, the Bruins sent the Leafs prospect Joe Colborne, a 2011 first-round pick and a 2012 conditional second-round pick. The condition on the pick was that the Leafs would get it if the Bruins reached the 2011 Stanley Cup Final or Kaberle re-signed with the club after the 2010-11 season. The Leafs ended up with neither pick as they shipped the first-rounder to the Anaheim Ducks in order to move up in the first round of the 2011 NHL Entry Draft. The Leafs picked Tyler Biggs with the 22nd overall pick, while the Ducks ended up with Rickard Rakell with the 30th pick. The second-rounder turned into a second-round pick in 2012, which was shipped out a number of times and ended up in the hands of the Dallas Stars. As for the players, after tallying 520 points in 878 games with the Leafs, Kaberle scored 9 in 24 with the Bruins. The following season he ended up with the Hurricanes before finishing his career with the Canadiens. Colborne played just 16 games over parts of three seasons with the Leafs. He tallied a total of six points before he was moved to the Calgary Flames. Now, he’s a mainstay in the Colorado Avalanche lineup, having played 62 games with the Avs this season. The next deal needs no introduction. The Leafs needed a scorer and got one in Phil Kessel. But what they gave up will always be questioned by those faithful to the organization. In return for the services of Kessel, the Leafs gave the Bruins a 2010 first-round pick, a 2010 second-round pick and a 2011 first-round pick back on Sept. 18, 2009. While Kessel put up some very good numbers with the Leafs – including not missing a game after the 2009-10 season – the picks turned out to be some incredibly talented players. 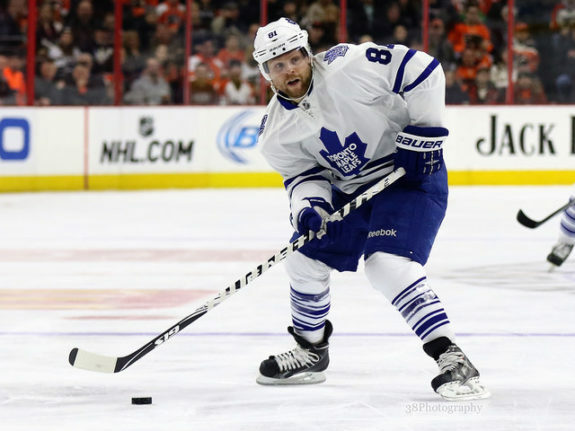 Over parts of six seasons with the Leafs, Kessel totalled 394 points in 446 regular season games. As for the Bruins, they used the two 2010 picks to take Tyler Seguin second overall and Jared Knight with the 32nd overall pick. Seguin played 203 regular season games over parts of three seasons with the Bruins, notching 56 goals and 121 points before they shipped him off to the Stars. As for Knight, he never cracked the NHL and is now playing in Denmark. With the 2011 first-rounder, the Bruins used it to grab Dougie Hamilton with the ninth overall selection. He debuted in 2012-13 with the Bruins and played 178 games for the team over parts of three seasons, tallying 83 points over that span. He, like Seguin, was eventually shipped out of town by the team to the Calgary Flames meaning that both teams are left with no one from this particular trade. The Leafs also made a questionable call on Jun. 24, 2006. 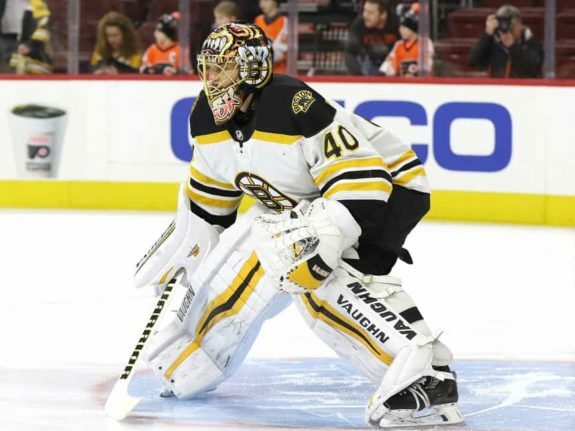 While the future is certainly not foreseeable in any way, the Leafs traded the rights to goaltender Tuukka Rask to the Bruins for Calder Trophy winner and starting goaltender Andrew Raycroft. Raycroft went on to play 91 games for the Leafs from 2006 to 2008 with a record of 39-34-14, a save percentage of .890 and a 3.17 goals against average over that time. He finished his NHL career with stints in Colorado, Vancouver and Dallas. From there, he went to play in Italy and Sweden before retiring in 2013-14. Rask, on the other hand, remains a major cog in the Bruins success. He debuted in 2007-08 and hasn’t looked back – including winning a Vezina Trophy in 2013-14 at the age of 26. In 436 games with the Bruins, he has a 229-134-52 record with the team along with a .923 SV% and 2.24 GAA. He also has 40 career shutouts. Oh, and don’t forget he won a Stanley Cup with the Bruins in 2010-11. While not nearly as big, the two teams engaged in a trade on Jun. 15, 2006. The Leafs traded forward Petr Tenkrat to the Bruins for a 2006 seventh-round pick. While Tenkrat never played a game for the Leafs, he did play 64 for the Bruins during the 2006-07 season and recorded 14 points. That, however, was the end of his NHL career. As for the pick, the Leafs used it in a deal with the Coyotes who eventually picked Chris Frank with the 188th overall selection. Franks never made it to the NHL. Finally, to find the fifth most recent trade between these two clubs, you have to go back to May 13, 2002. And like the Tenkrat move, it wasn’t one of major significance. The Leafs acquired defenceman Richard Jackman – who was a fifth overall pick in 1996 – for a young centre in Kris Vernarsky. Jackman played 71 games for the Leafs over two seasons and tallied two goals and eight points and never really played a major role on the team. The same could be said for Vernarsky who played just 17 games for the Bruins over the next two seasons, scoring one goal. Since then, both have played all over with Vernarsky staying in North America, while Jackman played as recent as last season in the EIHL. So whoever said that division rivals couldn’t trade, never saw what the Leafs and Bruins have done over the years. Kessel, Rask and – most recently – Kaberle have all been moved within the division. That said, is it safe to say that the Bruins have come out winners of these trades since 2002? Let us know your thoughts by commenting below and be sure to tune in next time when we look at some of the most recent moves between the Leafs and another division rival – the Buffalo Sabres.